Well, just when you think you've put something behind you, there's always a late-comer to draw you back in. While we all wait to find out how much of a second mortgage we'll have to take out to purchase 2010 Monfortino and/or Granbussia, here's the last 2010 Normale Barolo to seriously consider. It's no secret that we have an affinity for the stubbornly old-fashioned and incredibly unique wines of Antica Casa Scarpa. From the Casa Scarpa Barbera (an MCF staple), to the wildly aromatic Rouchet, to the wisely-aged Barbera Bogliona, all the way up to the big-gun Barbaresco and Barolo, this estate is one of the world's true gems in terms of both range of offerings and depth of library vintages. 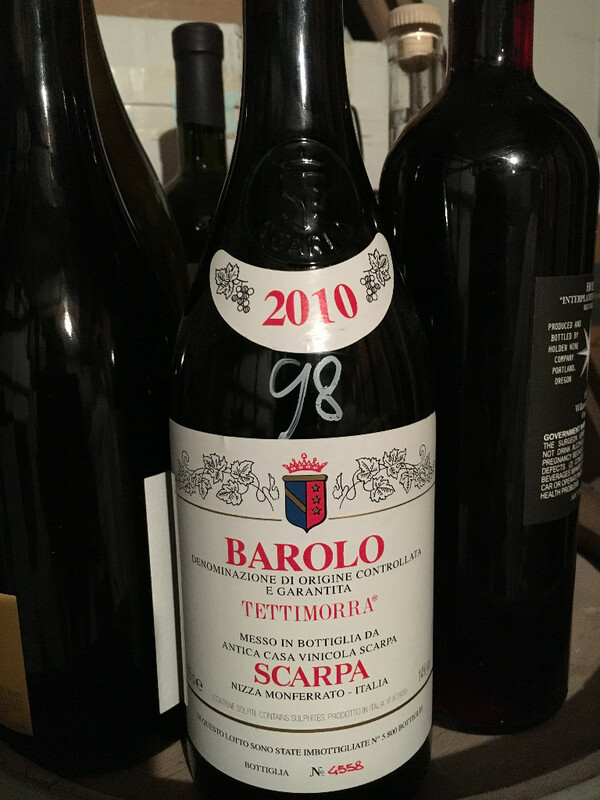 As I was making my way across their lineup of new releases last week, I knew that the 2010 Barolo was lurking at the end of the table. I was really excited to see how Scarpa's old-school, flowery/woodsy style of Barolo ended up meshing with such a powerful, structured vintage. It was at once, firmly structured, intensely aromatic and, above all, sublimely elegant, especially for a 2010. All of the structural elements are tightly packed, but the wine isn't a brute. It showed a very fine and pure red fruit that was laced with earthy (as in the bois kind of forest floor-y earth), herbaceous notes with a seamless mouthfeel that all culminates in a crazily minty finish. This is a flat-out lovely glass of Barolo that will sit happily in the cellar for a nice long time. Sure, Scarpa's style is not for everyone, but if you love great Nebbiolo, and want to experience one of the great expressions of it that, I believe, is totally unique among those in the 'traditionalist' camp, here's a smart place to start.